Doesn't seem right getting one of these without paying $300 up front, waiting three years to get it and being bombarded by proselytizing messages when opening it. Just build it, set fire to some money, don't play it for a couple of weeks and say 10 Hail Mary's and it'll feel more authentic. Me: "I wouldn't even know where to begin to give you the context for the joke." Wife: "Your sense of humour is exhausting." I'll try to get this built this weekend. Just finished the Coloursound Overdriver -- I'm going to need to repaint the music room after it blistered all the paint. Ha, just literally loughed out loud at both messages on the upper deck of a night (evening?) bus. Given that's where the weirdos hang around it went down pretty well...! Will definitely give this one a go, been stashing up parts for BMP and Rat clones/derivates also onspired by the pdf I got off of AMZ, really good read. I actually was planning to build a Rockbox in the near future. Would this be a good competitor? The Boiling Point took the circuit pretty much verbatim from the Landgraff Dynamic Overdrive, which took the idea from the Tubescreamer. This is Landgraff's similar modifications of the Rat. yep, the 308 chip was the giveaway. Hmmmm.... Was planning to build the Timmy until i saw this! Suppose I,ll just have to build Both . build the Timmy, it`s one of my greatest builds ever! I've ordered the gear for both, a naga viper,landgraff boost& noisy cricket..
Keep me giong over the Crimbo! VERIFIED! And really nice soundin´! Don't have a LM308 any others do the same job ? in presume the 4558 will work, probably not as high gain though ! Yup. 4558 is a dual opamp, so it won't work here at all. Viable sub would be NE5534, as that's the only one (as far as i know) that has balance/compesation loop between pins 1 and 8, just like LM308 has.. TL07* and LM741 don not have compensation, which in my experience cause the Rat to squeel like a pig. We could assume that the behaviour would be the same here as this is basically a Rat. I thought the difference in using a tl071 or similar was that it didn't require the compensation cap (100pF here, 30pF in the original) but should work just as wel as it should be able to do the job on its own... Could it be that using that kind of op amp while keeping the cap in place might have caused the squealing? I'm very interested in hearing more about this as I am a big rat fan and looking forward to tweak about and try a few mods/versions...! So you can connect anything (ok, not 240V AC) to pin 8 and it doesn't affect the opamp. Removing the compensation cap saves you a component, but it doesn't change it's behaviour. Squeeling comes along because the way it's wired - and it is missing that compensation. You are both of course right. I thought about it off the top of my head without minding my pinouts - slap on the wrist! And yes it's the 51pF in the Landgraff. Looks like I'll be building it in February! Wonder how the 308 will work in the buffer. "legendarily" might be the lamest adverb i've ever read. Just hooked this up to the test rig and it slays. I ended up playing for almost an hour. Going to knock my Madbean Slow Loris off the board. Yes. Using tantalums would always make sense. They outlast all electrolytics eventually. Don't know if they sound better, but they are cooler either way. Good to know, thanks Miro! Hi, i've a problem, i can't find the JFET 2n5457, can i use the 2n5459? if yes there are some changes in the circuit? Yes it's just an output buffer so there should be no problem using the 2N5459 instead. If you have any issues just swap the 10K source resistor for a trimmer so you can tweak the bias, but I don't think it will be necessary. I finished this pedal yesterday and it works, sort of. Only issue is that the distortion control does nothing. Just full distortion no matter what. 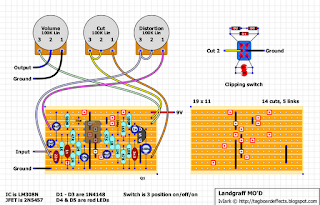 The only difference to this layout that I did was to use an on-on switch since that's what I had available - just figured I wouldn't get the "no diodes option" in middle position. I did wire the #2 leg of switch, labeled "cut 2" to the number 3 leg of filter pot - figured it didn't make a difference since they were connected together. I triple checked all the connections and they are correct. Turned out to be a dodgy distortion pot. I had measured the ohms as I turned the pot and it seemed ok. Went ahead and replaced it anyway and now it's working perfectly. Excuse my ignorance bur were does "cut 2" attach to? I think Graham meant the connection coming off the center-left lug on switch, Mark. I lucked into a bunch of germanium diodes, a various types and eras. Is it worth trying any particular types in this? It's always worth experimenting to see what you like. Use sockets if you want to experiment before committing yourself. I am bad at phrasing. I meant: are there are particular Ge diodes that match up nominally with the 4148 diodes here? All Ge diodes will seem quieter than 4148's because they have a lower forward voltage which means more of the signal is dumped to ground, but any would be suitable to use and they definitely have a different character to them than the silicon diodes. 1N34A is a popular and easily obtainable Ge diode. Thanks! Have been wondering how to best use this stash of diodes. Finished this up this morning. Switch alone kinda steals the board space from my '88 RAT. Not sure if that makes me happy or sad. I am going to read up on this (again), but the LEDs provide symmetrical slipping while the 1N4148s are assymetrical, correct? I much prefer the 1N4148s and the middle/lift position would be good for knocking over small children (it's friggin' loud). Thanks again for this and all the many other layouts. Sorry for peppering with all the questions, but I've been on a building tear and this is by far my favorite site. I frequent only second to Facebook. Check the diodes. If they are damaged and creating a short then the entire signal will be dumped to ground. 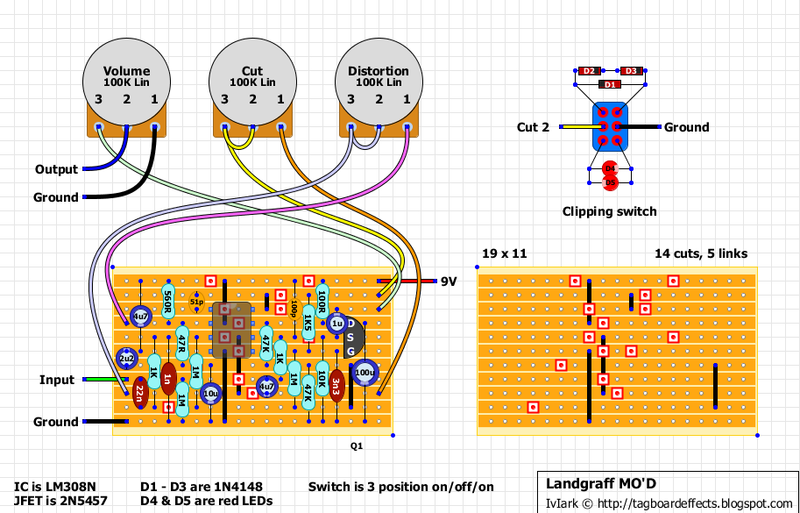 I actually tried a completely different switch, as well as diode and LED set, and I ran into the same issue. I tried swapping out the LED's on the second switch and same issue. Then I tried using a 3rd switch, this time using only jumpers to connect assuming that if the issue was with faulty components, that it should at least work with jumpers, and still in both the "on" positions, the signal goes dead. I am at a complete loss here (and on quite the losing streak...). Is the switch supposed to connect to Cut 2 as well as have a jumper between cut 2 and cut 3? yes. 2 & 3 are jumpered and the switch connects to either lug. if the pedal is going dead in either position, then you MUST be grounding the circuit in those positions. it seems that your diodes & leds are not oriented properly, or they're shorted. it really couldn't be much simpler than that. Thanks, John for the response. I have it the switch connected to Cut 2 to Switch 2 and Switch-5 going to ground. Are you saying Switch-5 shouldn't be going to Ground, but to somewhere else? I understand if the diodes or LED's could be oriented incorrectly, but I have the same issue when I simply use a jumper from Switch-1 to sw-4 or froms sw-3 to sw-6. That's the part that confuses me. I think I have the same problem as you JK. Center position no problem but when i turn to diodes or leds there is only a very silent distortion coming trough, even with all knobs maxed. I changed switch and leds, diodes. I noticed that with each set of leds only 1 led is burning. new transistor solved the led problem. Also noticed that my distortion knob does not work as it should. First there is nothing and when I turn a little bit then I have full distortion. The distortion does not change when I turn the pot. I allready repleaced the pot and it was the same. Also there isn't much difference between the three switch modes. Still this pedal sounds awesome. just finished this and have crazy squeeling going on, it works and all but squeels like crazy, offboard wiring is decent. tried swapping opamps with no results, using the 308N. any ideas what this could be? I had squealing on mine, but it was when the effect was bypassed with the gain knob up past 2 o'clock or so. Turned out it was because I didn't jumper input to ground on the switch off position. Fixed that and nary a squeal since. Are you squealing with effect on or bypassed? turns out i missed the 51pf cap haha, not the first time i miss those small ones! Anyone know a link to the schem used for this layout? I was hoping to try mod a rat rather than do a scratchbuild. I just built this one, only I modded it with a trim pot so I could adjust its low end response. I also raised the value of the input cap ( it's socketed) so I could use it with my basses with no low end loss. ive never been a fan of LED clipping, the decay sounds bad to me. I dont know how to describe it. how do you like the mosfet clippers? did you wire 2 back to back? I like the LED clipping. Mosfet was wired like mod of beavisaudio, but next i'm gonna try to do the mosfet without the germanium diodes. http://www.beavisaudio.com/projects/fkr/images/MightierMouse.gif. Best MOD for the MO'D is Log taper for distortion instead of linear. i built this and have checked it over days several times with no luck. the only sound i am getting is a slight farting sound when i switch to humbuckers and strum hard. I hardly ever get this little sound in my builds after checking everything (especially since i measured every single component before I populated them and have double checked to make sure all the resistor color codes are correct after populating. I orderd a NOS ua308 form small bear and unfortunately dont have a backup- could i sub a ln741? also thinking it might be the switch- could i just remove the switch and that would be like the 'diode lift' center position? or wht could i do to take the switch out of play? Hi, I've do it, but I don't have the 2N5457 and I've used a J201, don't the LM308 and used a TL071, last the 47pf instead of 51pf. The pedal have a 60/70% of the volume and oscillation very loud in few positions of the pots.. Your answer is LM308. Compare the datasheets of TL071 and LM308. You'll find that those are not pin-to-pin equilevalent. Thank you i buy this and try! it always cracks me up when people say that they've substituted a whole bunch of parts and then wonder why it doesn't sound right. --answer: USE THE CORRECT COMPONENTS! I have now a CA3080 is equivalent to Lm308? No. That's an OTA, which works in completely different manner. Most single opamps are equilevant, but there's nothing to replace LM308 without any other modifications. Fix it with 51pF and LM308N. All working great. Tannk you all! Only one thing is too much volume at start to turn the volume pot, try to change the value pot or else? Hey, got it wired up and it works except the tone control seems to be stuck in a completely counter clockwise position (not physically). The resistance varies as the pot turns, but the tone stays very bassy, so not sure what's up with this. Any thoughts? Fix it with alternative true bypass wiring! yeah great pedal! Just take it all literally. The LEDs and diodes are connected as shown, between lugs 1 and 4, and 3 and 6. Then connect lug 2 to Cut 2, and lug 5 to ground. When you say connect 2 to cut 2 and 5 to ground, you are telling me just to connect them with out moving any of the wires such as Cut 2 and ground. I just ad them to the circuit,,Correct? I mean connect a wire from switch lug 2 to Cut 2, and from switch lug 5 to ground. So lug 2 of the cut pot in the layout has one side of a link connected to it. You also need to take a wire from the switch to that lug. And lug 5 needs to be grounded, so take a wire from that lug to the bottom right hand hole of the board and that will connect it to ground. Everything else in the layout stays exactly the same. Remember that when I mention connecting to "ground" on an offboard switch or pot on a layout, I'm not telling you to solder to that specific "ground" point shown on the board, it just means that something else needs to be grounded. So you can make that connection by soldering to the ground rail on the board as I suggested above, or you could take it to the input jack sleeve connection if you want to. It doesn't matter because all points of ground are connected to each other with the offboard wiring. Built this and it sounds great but I noticed after a few days the volume pot stopped working/isn't doing anything (the volume is now at a fixed *loud* level at all times) All other controls work fine. What should I troubleshoot? The pot may have failed causing the issue, maybe an internal short between pins 2 and 3 making the pedal at its loudest all the time irrespective of the rotation. Either that or maybe an unwanted solder bridge maybe between pins 2 and 3? Whatever it is the volume pot is certainly the problem so I would be paying attention to that, and maybe swapping it if necessary. the pot was bad...swapped it and now we're good! Thanks! Hey there is the shaded side of the LED's the negative side? Thnx! Is there a link to the schematic used for this Layout? Finally got this one working. Built it about a year ago and couldn't figure out what was wrong with it. Went through my few dodgy builds today to see if i had missed something. Guess what staring me straight in the face was a resistor connection in the wrong place. Makes you realise you should never throw out a build just because you can't see the problem immediately, put it to one side and go back to it later. Maybe not as long as a year though. Anyway, this sounds fantastic, the clipping switch gives a level drop on both options but that's ok. I know this thread is pretty old but I'm stuck. I too only get a quiet "brap" sound and only on the bottom string when plucked hard. Any ideas what the issue could be? Your voltages on the IC are way too high on all pins, except for the supply pin which should be around 9V. Pins 2, 3 and 6 should be way under 5V. This seems to me like a short that's burned the opamp. Knife the gaps, triple check all cuts / component positions and swap the chip. Also, double check your supply. If you are using a battery, then it's dead at 7,6 volts. Thanks for the reply. I ran an audio probe over it and as you suspected, the signal entered at pin 3 but did not exit. I ordered some new 308's. Plenty of time to make sure my solder job is up to snuff. Thanks again. Update: Double checked for bridges and put a new chip in and all is working perfectly. Thanks for the help. Hi! Any suggestions to fix the squealing when no guitar is connected to the pedal input? Also, would J201 work in place of 2N5457 in this pedal? Do you guys use the ebay fake 2n5457`s and do they work like genuine ones in applications like this for example? Use a switch wiring scheme that grounds the input when in bypass. Check out the Offboard wiring section at the top of the page. The FET here is just used as a buffer so any FET, in spec or not, should work fine. Ok, thanks for the info. But the grounded input-bypass wiring does not do the trick. I´ve always used that kind of footswitch-wiring and always got the squeal with these type of pedals (RAT). Just to add to what ciaran said. Out of spec doesn't mean it's fake. If it's fake it's a part that either been a FET of a different type that's been relabeled or it's not a FET at all. So keep that in mind. True. By the way has anybody found an Ebay seller who still has (I assume they are not being made anymore) genuine or "in-spec" 2n5457´s? "Buyers beware of far eastern fake JFET's being offered on eBay at reduced prices. The fake parts often have an abrasion on the print face (presumably due to the oringinal marking being buffed off) and often have the date/batch code number C521. This applies to both 2N5457's and J201's. Faichild parts usually have two capital letters followed by two numbers for the batch code. The printing is often smudged. Another indication of fake parts is the small recess on the circular part of the device having no marking. The genuine ones that we have on offer are marked with a number usually 0 to 7 or a capital letter L to Q.
Genuine parts should have clear legible printing, shiny appearance and a character in the recess as described above. Please note that the above is based our own observations from purchased samples and does not apply to all JFET's being offered on eBay. This for your guidance only." If you're in the US, smallbear is a reliable source for legit JFETs. Hi..I build this pedal and it works fine. The only thing I don't understand is why it squeals if I increase the volume and the gain. Anybody had/have this problem? Thanks. This is an issue that's quite common with a Rat and derivatives. Up the compensation cap to 100p and the issue should be gone.